The decisions you make in your life are the components that will make up your future. 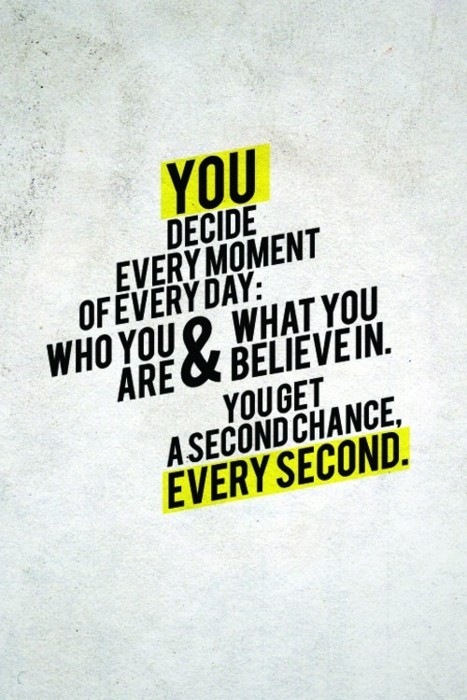 Every day, every minute, every second you are in the world, you will face decisions. The choices you make can lead to a bright future, or a path of misfortune. If you live every second to the fullest, you will be able to fix the errors you make. It is only natural to make mistakes in life, for if you don’t, then you can never learn and correct your ways in the future. In most cases, when you jump on a path it is not a one-way road. You can always retrack decisons and learn from the past in order to prevent mishaps in the future. Every choice you make comes with a final product. Before you make a decision, always think of the possibilities. Don’t fear choosing a path, for if you make a mistake, you can start again. You have a lifetime to make decisions and it will be something you encounter all through life! ~ by Across the Universe on February 17, 2011. That’s right! I love that qupte–you DO get a second chance every second! That is an awesome way to view life. This entry was posted on February 17, 2011 at 2:23 am and is filed under Uncategorized.You can follow any responses to this entry through the RSS 2.0 feed.You can leave a response, or trackback from your own site.